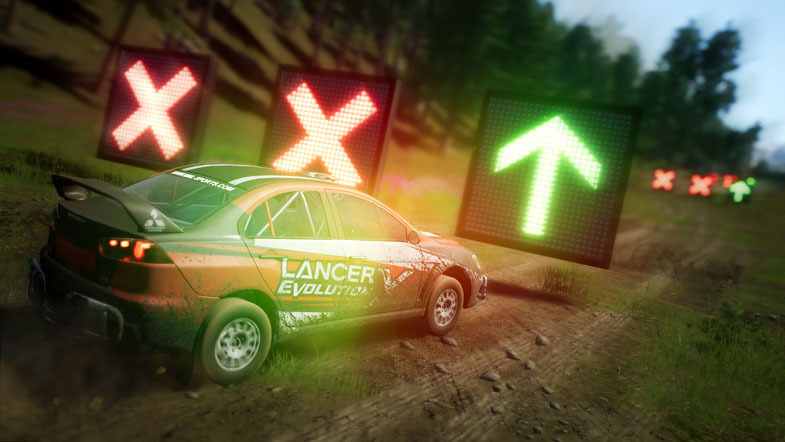 Milestone S.r.l., a veteran developer of racing titles, has come back on the scene with a new off-road racing game called Gravel. The title promises the ultimate off-road experience and gives you a plethora of disciplines to test your driving skills. 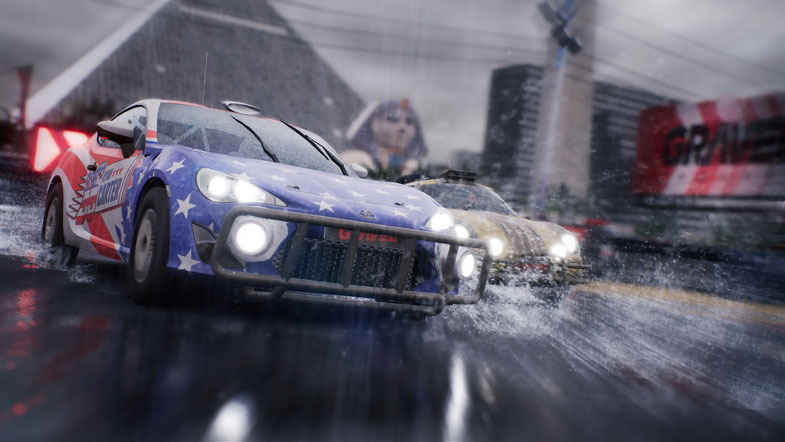 Whether it’s on incredibly slick pavement or a muddy stadium, you will push these high-powered monsters to their limit. The driving experiences are broken up into four styles: Cross Country is a point-to-point race through some pretty elaborate scenery which will have to be enjoyed sideways (while drifting or flying) at breakneck speeds; Wild Rush is a lapped circuit race across a variety of environments and road surfaces; Speed Cross puts you on real-world tracks with added mud and jumps to give you some extra high flying action; and finally, we have Stadium races, which are short, muddy tracks in packed stadiums that put drivers in close and dangerous quarters while fighting for first. Each of these styles has different race types to vary your experience, such as time trials or elimination races. Vehicles are similarly broken up into specific categories. Speed Cross consists of overpowered compact cars, such as Mini Coopers and Volkswagen Beetles. In stark contrast to this, we have eight hundred plus horsepower trophy trucks, as well as an abundance of iconic rally machines from automakers like Lancia, Subaru, and Porsche. Each one of these vehicles is decked out with liveries, bumper guards, and extravagant light setups. When you select them, you may choose any of the models that are available to you. All but one in each category are locked at first and others unlock as you reach the appropriate level, complete specific events, or, in the case of two models from Porsche, you can buy the Day-One DLC. These two cars are available for you to view, but require nearly three dollars to unlock. The number of customizations for your ride are limited to a small selection of liveries which similarly unlock based on your level. Your level comes from points which are awarded based on your placing in a race, style points for sick drifts, and your race options, such as turning off driving assists — which I highly recommend doing for an added fun factor. You can get points by completing runs in any of the race modes, whether it’s a free race, time trial, one of the weekly challenges, or the Off-Road Master's Career mode. The overall racing mechanics are relatively stable. Gravel appears to be trying to blur the lines between racing and simulation. In doing so, though, to a point, they fail to satisfy either. On the track, you will be confronted with a very arcade feel where your car has the desire to skate all over the trail. This feel, if you’re not heavily into sim titles, makes for a fun and enjoyable ride and allows you to kick the car sideways around corners easily. However, most of the NPCs don’t drive like that and take more intelligent and tight lines, which may lead you to ram your opponents on the insides of corners to jockey for first. One of my major issues with the title is the amount of time it takes you to change cameras to view beside or behind your car. Rather than instantly cutting to that view, the camera moves around the vehicle. It’s like turning to look behind you rather than using a mirror, except you have a severe neck injury, or your safety gear is restricting your movement, so you have the slowest full-body turn ever. You can imagine why that’s pretty dangerous at two hundred km/hr on a dirt road. One redeeming factor is there are arrows on your display showing the position of other vehicles if they are in close proximity behind you. It’s easy to set in motion, and you have an unlimited amount of rewinds with no cooldown. This takes away a lot of the challenge from the game. You can also adjust the AI difficulty before every race to increase your experience points, although the difficulty does seem to scale either with series or level as you progress, even if the AI difficulty setting doesn't change. FINE, BUT NOT EXCEPTIONAL GRAPHICS. The graphics are another point where this game feels like it’s trying really hard. If it were made a few years ago it would be great, but with other mainstream racing titles hitting PC, such as the Dirt series, Forza on the Microsoft store, Need For Speed, or the anticipated launch of The Crew 2, Gravel really needs to be on top of its game regarding models and track graphics. The vehicle models are exciting and unique, capturing the essence and styling of rally cars, which is why everyone loves them. However, they look soft and low quality compared to the photorealism of other titles. Likewise, the tracks have a lot of character and interesting details, all the way from the mountains of Alaska to the coastlines of Namibia. Each one of these tracks is thoughtfully crafted and full of character. But the overall asset graphics aren’t top notch here as well. There’s also minimal ground deformation, other than a few tire lines trailing behind the vehicles, which is gone by the next time around the track. As with other aspects of the title, there’s nothing horrible about the graphics — they’re just nothing exceptional.